I’m going to start off by saying sorry, this isn’t my usual life tip. I have many life tips lined up to share with all of you, but the past few days I may have had a couple of real rainbows, but am far from rainbow or even sunny moments. This morning I woke up and felt like buckets of cold rain had been poured on me for about an hour straight. It’d say it’s at a mist now, but I’m still not feeling like my happy self and I didn’t want to fake it in a post for all of you. Just because it’s raining on my Monday, doesn’t mean I want it to rain on yours! That’s really all I’ll say about that because this isn’t a place for me to vent, rant, and cast my shadow. This is a place of improvement and making the world better. I don’t think explaining every little detail of why I’m feeling like I’m feeling right now would help anyone, not even myself. 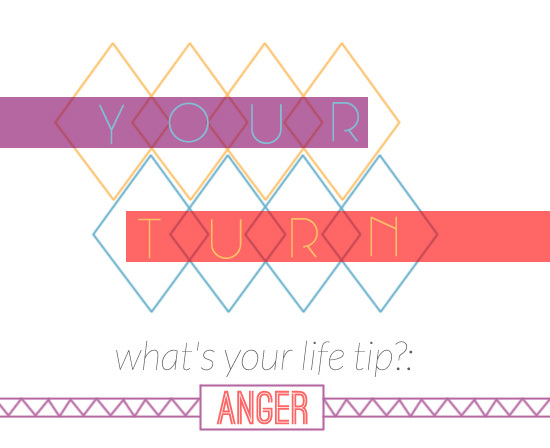 So… I ask all of you: what’s your life tip for dealing with anger? With others’ directed at you? With your own? With the world’s? I’m not perfect and I’ve never claimed to be. One of my biggest faults is that I get angry too easily. I have a quick and hot temper and there are certain people and issues that bring out the worst of it. I’m working on it, but even when you think you’ve learned all there is to know, the teacher hands you the test and you realize that all of the answers leave your mind. On another note, I’ve tried to surround myself with positive people or at least those who are working to be their best (or are open to the idea). 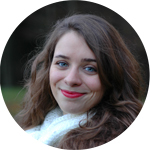 Even in the blogging community it seems that most are open-minded and positive individuals. It’s (hopefully) rare to get a mean comment or a mean individual enter and tear down what you’ve worked on for so long. What do you do with someone who’s mean and so full of anger? What do you do when you just don’t understand someone’s logic and “talking sense” doesn’t seem to work? I look forward to hearing your responses and hope all of you have a wonderful Monday!